This week we learn about a cooperative-owned publication from the man who reps it. This morning I was interviewed for Brownfield Network’s “Innovations” by Steve Mays. In this week’s Missouri Beef Industry Council Report I interview Dawn Thurnau, MBIC director of marketing who provides numerous tips for Daddy Day and a great idea to top off a grilled steak on his day. I’m going to make sure this is done in the Zimmerman household! The grand opening of Mid-Missouri Energy (MME) last Friday was a major milestone for the renewable fuels industry in Missouri. In this week’s program I interview Allan Noe, director of communications for Croplife America. 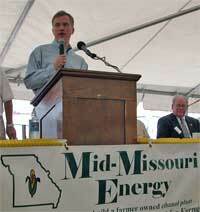 It was a big day for the ethanol industry in Missouri. We had the governor, some congressmen, various ethanol industry leaders and a couple thousand people. This was Malta Bend, MO! It’s time once again for the weekly interview program from the Missouri Corn Growers Association. Missouri’s cattle producers are urged to take part in elections for representatives to the Missouri Beef Industry Council. That’s the message in this week’s MBIC Report in which Cindy interviews executive director Steve Taylor. One of the sponsors of Team Ethanol this year is the Illinois Corn Marketing Board. Representing them at the media event on Friday was Bryan Fogerson, board member and corn grower from Tuscola, IL. Bryan allowed me to interview him about his organization’s sponsorship and he talks about what the increased use of ethanol will mean to farmers and consumers.